Done in Transparent Watercolor. 10 1/2" by 15 1/2" (27cm by 39cm) Featured in "Splash 8"
"...I discovered that I could enhance the soft look of my watercolor paintings by lightly scraping the dry paint with the edge of a double edged blade. The razor acts as an eraser to gently lighten or remove selected areas of paint. 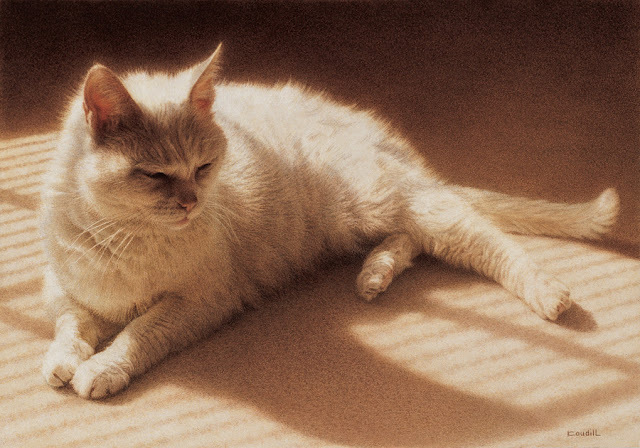 ...My old friend, Minnie, ... was diagnosed with cancer, (and) I wanted to paint ... the familiar softness of her fur, as well as the gentleness of her spirit." Brilliant work, as always from the "Splash" series. I love how the shadows connect the cat to the edges. The dark background does not detract you from the main subject, and the overall warmest of the painting is portrayed brilliantly.